Table: 41" x 39" x 29"HChair: 22" x 25" x 34"HAluminum FramePE Resin WoodVi..
Table: 41" x 39" x 29"HChair: 22" x 25" x 34"HAluminum Frame / PE Resin vin..
3-Pcs Outdoor Bistro Set P50206Table: 24" dia. x 27"HChair: 17" x 17" x 34"..
3-Pcs Outdoor Bistro Set P50207Table: 26" dia. x 27"HChair: 18" x 20" x 35"..
3-Pcs Outdoor Bistro Set P50208Table: 24" dia. x 28"HChair: 17" x 18" x 36".. Create a quaint outdoor sitting area with this bistro set that features two.. Delight in the sun with this unique 3-piece bistro set for the outdoors. It..
P50235 Table x 1P50181 Chair x 2Table: 30 Dia x 28"HChair: 21" x 26" x 33"H..
P50236 Table x 1P50182 Chair x 2Table: 24" Dia x 28"HChair: 21" x 22" x 29"..
P50236 x 1pcsP50183 x 2pcsTable: 24" Dia x 28"HChair: 21" x 22" x 29"HAlumi..
Table: 28" x 20" x 15"HArm Chair: 33" x 28" x 30"HPE Resin Frame / Panel..
P50261 x 1P50134 x 2Table: 20"dia x 18"HArm Chair: 25" x 29" x 33"HAluminum..
P50262 x 1P50135 x 2	Table: 20"dia x 18"H..
Table: 20 Dia x 18"HArm Chair: 24" x 29" x 37"HAluminum FramePE Resin Wicke..
Classic and romantic style is provided with this 4-piece patio sofa set tha.. Arm Chair: 33" x 29" x 30"HLoveseat: 56" x 29" x 30"HSofa: 78" x 29" x 30"H..
P50230 x 1PcP50170 x 4PcsTable: 35" x 35" x 29"HChair: 23" x 26" x 46"HAlum.. 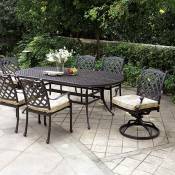 Relish in a warm sunny day or night with this 5-piece patio set that featur..
Upgrade your outdoor living space with this patio table set that features u..
P50230 x 1PcP50169 x 4PcsTable: 35" x 35" x 29"HChair: 22" x 27" x 38"HAlum..
P50312 x 1P50314 x 4P50316 x 1Sofa: 32" x 32" x 26"HChair: 32" x 28" x 26"H..
P50232 x 1PcP50169 x 6PcsTable: 63" x 35" x 29"HChair: 22" x 27" x 38"HAlum..
P50232 x 1PcP50170 x 6PcsTable: 63" x 35" x 29"HChair: 23" x 26" x 46"HAlum.. Entertain family and friends by making a grand statement with this 7-piece .. Relax with your friends and family on a sunny day with this 7-piece patio s..
A pair for the modern outdoor experience, this 7-piece patio table se..
P50250 x 1pcP50186 x 6pcsTable: 63" x 34" x 29"HChair: 22" x 25"x 34"HAlumi..
P50242 x 1P50187 x 6	Table: 63" x 34" x 29"HChair: 22" x 25" x 34"HAluminum..
P50279 x 1P50174 x 6Table 59" x 32" x 29"HChair: 23" x 26" x 35"HAluminum F..
P50280 x 1P50188 x 4P50189 x 2Table: 66" x 39" x 29"HChair: 22" x 28" x 35"..
P50257 x 1P50198 x 6	Table: 80" x 38" x 29"HArm Chair: 84"x 22" x 34"HAlumi..
P50258 x 1P50199 x 6	Table: 80" x 38" x 29"HArm Chair: 84"x 22" x 34"HAlumi..